I have a question regarding a Clematis Jackmanii vine. I have read that the pruning methods for this plants varies according to variety. Some will only flower on old growth and some will only flower on new growth. Some varieties will flower on both. I can't seem to locate anything specific for the variety I have. I was wondering if you could give me some guidance on this particular variety. In addition, I live in the San Francisco Bay area, which has a very Mediterranean-like climate. The Clematis vine has already begun to sprout and the Fairy Lilies ( Zephyranthes) that I planted last year have not died back at all. As I have only seen both of these plants grown in more temperate climates, I am concerned that the mild winters and extended growing season will have an adverse affect on these plants. Is this something I should be concerned about? Clematis Jackmanii, like any other plant, will thrive if you are able to meet its growing requirements, and give it reasonable care. Most Clematis require a minimum of 6 hours of full sun per day to grow their best, however some light shading during the hottest part of the day is beneficial. It is essential for the roots of Clematis to remain cool and moist so protect the root area with a heavy mulch, or the shade of low growing plants or even a large flat rock. A few of the very large flowered varieties should be planted in a more easternly exposure to prevent excessive flower fading caused by to much sun. 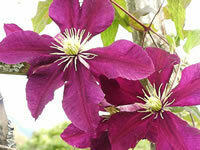 Clematis like a peaty soil, but you must add enough lime to ensure the soil is not too acidic. Generous amounts of bone meal and compost should be added to the soil, but should only be cultivated into the top inch or so. Depending on the species, Clematis flowers will form on either the current season's growth or on that of the previous year. Clematis Jackmanii buds for on the new years growth. This type of Clematis have a tendency to become bare at the bottom of the vine unless they are pruned annually in late winter or very early spring. Cut the vines back nearly to the ground, leaving at least one pair of healthy looking buds on the trunk. Most clematis will require staking so the twining leaf petioles can cling and climb upward, although it is not a problem if you choose to let the plants sprawl over the ground, fences, or wherever you'd like. At this time of year on Cedar Hill, I would normally have a foot of snow on the ground, and be looking forward to the temperature getting back above freezing. That hasn't been the case here, this year. I have new growth on many of my plants as well. The unknown denominator is what will happen between now and spring. A sudden drop in the temperature to freezing can be fatal. Should the weather remain mild, there will be no problem, your plants will have a healthy headstart. It a good idea to pay attention to your upcoming weather forecasts though, and if frost or a hard freeze is imminent, you must take measures to protect your plants. The roots of bulbs, ground covers, and other low growing plants should be mulched with a heavy cover of preferably dry leaves and clippings. Larger plants can be protected by covering them with a blanket, burlap, or a tent made from plastic sheeting. If you create a plastic greenhouse, be sure that the film is removed before any bright sunny days or you will bake your plants. The keyword in this instance is vigilance because we gardeners are always at the mercy of Mother Nature.